I have been ice fishing with jigging raps for a couple years without success. What are a few jigging cadences to try with the jigging rap that will help my catch rate increase? Thank you for any information you provide. 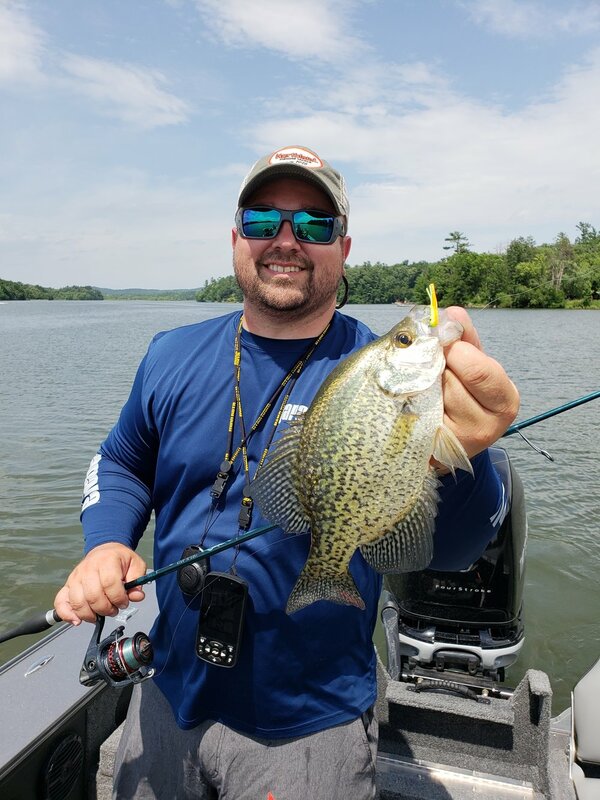 Jigging raps are great lures I’ve been fishing a long time, especially for panfish, but have really re-discovered using them over the past few years for walleyes. A trip with Grant Sorenson a few years ago triggered some extra looks from me, and I kept finding myself using it more and more. Especially as zebra mussel infested lakes become clearer, water bodies like Mille Lacs, Leech, and even Pepin have become better jig-rap lakes at least for me. I think that has something to do with the way the lure aggressively swings, zips, and darts around, triggering reaction strikes from walleyes that get a great visual on the lure. Keep in mind, there’s a lot to the rod and line combination. The new St. Croix Search Bait and Outside Eye Rods were designed for this lure and others in the same weight/displacement category. I’m pairing it with Sufix Fluoroclear and in deeper water I like that there’s a bit of flex and stretch, but not too much. Something that will help you unlock some great cadences is literally just studying it on an underwater camera. Last year I tested some new baits and kind of have it down to a process at this point. I get in a comfortable place, either wheelhouse or portable, and drop that Marcum Quest Camera. Examine everything from big rips to small shakes, and everything in between, exactly as a fish would see it. Learn what it takes to rock a bait back and forth, and specifically for the jigging rap, how to swim it in a circle. Practice those and know what the bait does so you can pull the camera so it won’t spook walleyes later with fish on screen. Keep in mind that it’s not summer, and a fish’s metabolism is not at the same rate either. Fish can be aggressive, but overall you won’t fish a jigging rap in the winter with the same amount of lift/swing that you would an open water setup. What relative big swings you do are for drawing in fish, but the jigging rap can scare more fish than it catches if you continue to rip with fish on screen. Smaller lifts and slack can be too aggressive too, as without knowing where the bait is darting you can actually turn them off by having it unnaturally charge them. Once a fish is on your flasher, higher above them is a safe zone, and I usually only drop to reset the cadence or pound the bottom and stir up sediment, the latter happening only after a fish is starting to drift off screen. From there, I try to unlock that rocking motion as best possible, relying on my underwater camera work to inform that jigging stroke. As always, take a fish’s temperature and interpret the aggressiveness of the mark. My biggest fish on a jigging rap is also my biggest walleye to date, nearly a 13lb fish from Lake Erie that came among a flurry of 3 fish that went well over 25lbs. Those fish reacted like bait perch, flying around the graph, and vapor-trailing up to smash baits from 5-7 feet below. Big rips didn’t intimidate them, and drew the attention of that school I’m convinced. Conversely, last winter on Mille Lacs I was having more success fishing it with a few darts and more subtle dancing in circles, then just quivering it rapidly with fish on screen. Point being – each fish and water body is different, and what works one place may not work well in another. Getting good with that lure, then offering fish a variety of looks is usually the key to success. Target-rich environments help narrow down the winning look that much more quickly. Good luck, and keep at it!